Miracles follow Mike Hutchings. The Lord has used him to heal nearly 1,600 people of what he calls "soul injuries"—post-traumatic stress disorder (PTSD) and other trauma-related injuries. More than 10,000 people affected by trauma have reported being healed through those who have been trained through his God Heals PTSD ministry. Though known in charismatic circles, Hutchings has never before gone on record about his trauma-healing ministry. Evangelist Robby Dawkins was present the first time God used Hutchings to heal someone of PTSD. At Dawkins' church in Urbana, Illinois, Hutchings ministered healing to Ronald Nixon, a U.S. veteran of the war in Afghanistan. "He wasn't able to even sleep in the same room with his wife because of night terrors and physical violent sleep disorders," Dawkins says. "He had been prayed for many times before. As Mike was ministering to him, I stepped over and just observed for several minutes, and I could immediately see this stuff being peeled away, both emotionally and spiritually. "Ron informed me the next day through tears that he had had the best night's sleep he could ever remember. His wife verified he had not awoken. They resumed sharing the same room and bed within a week and have been problem-free in this area ever since. I was astonished. This was the first of Mike's prayer and ministry model for ministering freedom to people with PTSD." That was in 2011. Today, Hutchings' training sessions have gone viral. He has trained more than 8,000 people across the United States and in five other countries how to pray for trauma victims and see results. PTSD affects more than soldiers; those afflicted include people who have suffered trauma from sexual abuse, church hurt, workplace injuries or any other incident that triggers the brain's neurological pathways to recreate the incident again and again. "My primary message is simply this: No matter what trauma you've been through, no matter how much you've been traumatized, you no longer have to be defined by your history," Hutchings says. "You no longer have to be defined by what you've experienced or how you've been treated. You no longer have to be identified by what you've done to deal with your pain. You can be healed in Jesus' name and allow Him to restore your broken soul." Hutchings has spent more than 35 years in some pastoral capacity, ministering in congregations that range from Baptist to Vineyard to Mennonite. He is director of education at Clark's Global Awakening, an evangelistic ministry based in Mechanicsburg, Pennsylvania. He also wrote Soul Restoration: God's Answer for Healing PTSD and All Trauma, due out this summer. But healing isn't Hutchings' primary focus, and he has no formal training in trauma treatment. He lets God use him to heal, then does research to learn more about what happened. He prefers to train others to operate in the Holy Spirit and see the miracles of PTSD and trauma recovery in their own communities. Those who have learned his prayer model have seen miracles and testimonies that prove God is still in the healing business. Hutchings' prayer model addresses the root of trauma, not just the symptoms. When he goes before the Father, he considers the Psalms, many which were written by David, the man Hutchings says was the most traumatized person in the Bible other than Jesus. Trauma is a disorder that affects both brain and body. When a traumatic incident occurs, images are seared into the brain that physically and emotionally haunt the victim. "It's not like something in the past; they can have a flashback or a trigger, and it feels like the trauma is right there," Hutchings says. "The Bible speaks of trauma as brokenheartedness. I call it a soul injury, where your soul—which includes the mind, the will and emotions—has been impacted by a trauma that you just haven't experienced. Now, everybody has some kind of trauma. Many people are able to move past their traumas because they have resiliency in their soul. ... But there are many folks who carry trauma with them, whether that be from childhood abuse or whether it be from military service or things that they've witnessed." Hutchings trains people to specifically pray over trauma victims to restore the dream God has for their lives. His model seeks to heal the soul of those suffering through several spiritual steps. "That's one of the things that happens with people who have been traumatized, particularly if they've been repeatedly traumatized: They begin to believe a lie that the trauma speaks to their identity," Hutchings says. "Therefore, they become identified as 'victims.' They see themselves as somebody whom bad things always happens to. That's not the identity God has given them. They're beloved sons and daughters who have just had some bad things happen to them because they live in a broken world." First, the intercessor reminds the victim of the promises God made to the victim, which are found in the Scriptures. Second, the intercessor walks the victim through the forgiveness process, both for themselves and others who have hurt them. Next, the intercessor will break off the pain and guilt associated with the trauma. Although each step may be easy to describe, the process can be grueling, especially with demonic forces involved. "A huge portion of this prayer is simply declaring God's purposes and promises for their identity as a son and daughter," Hutchings says. "So it is breaking off shame, breaking off guilt, helping them to forgive themselves as well as anybody who's hurt them. It is also about cancelling the assignment of demonic influence that lies to them, saying they have to live with that stuff for the rest of their days. So there is a spirit of trauma. There's a spirit of torment. There's a spirit of fear." These spirits often manifest in the form of suicidal thoughts and actions, especially in the military community. A 2015 U.S. Department of Veterans Affairs study estimates 20 veterans commit suicide every day. Other military organizations claim the stat hovers closer to 22 per day. "That's caused by a spirit of suicide that comes after them," Hutchings says. "Now they're not possessed by those spirits. They simply are listening. ... When they're receiving these thoughts, they think it's their thoughts, because trauma actually opens a door for the enemy to come in and torment people. Until that soul wound is healed, it's like there's that open door there, and they can't have control." The model is just that—a model, not a formula. Healing doesn't necessarily happen instantaneously. After the prayer time, Hutchings or whoever is praying may ask the traumatized person to check in the following day. If healing isn't evident, they will pray again. And again. The prayer goes deep, and those trained under Hutchings are taught to understand the science behind what they are addressing in the body and why they need to pray specifically concerning a certain area of the brain. Psychology Today reports that chronic PTSD patients have gray-matter structural damage in the prefrontal, occipital and parietal lobes. As Hutchings or his teams pray, they speak to these areas in the brain and spiritually sever the memories lodged in the hippocampus. When the memory pathway is broken from the senses, healing pours over the person as they experience freedom. Hutchings has never even met U.S. Army veteran Matthew Fisk, yet Fisk is eager to talk about how Hutchings' work healed him. Fisk says he was held captive by the chains of PTSD since a 2004 ambush in Iraq. Two of the platoon's four vehicles were destroyed within minutes. Fisk's gunner, Sgt. Eddie Chen, was killed. The platoon leader ordered the survivors into a nearby alley to wait for rescue. And that's when the unthinkable happened. "As we set up our defense, the enemy ordered the women and kids to march toward us from both ends," says Fisk, who has participated in 214 combat missions. "By the time we had stopped killing them, my soul was shattered." Doctors diagnosed him with PTSD, but Fisk longed for freedom. After a friend gave him Hutchings' DVD Healing PTSD, God began a work in Fisk's heart. In 2016, he decided to follow the step-by-step process. "To my surprise, Dr. Hutchings laid out a compelling case," Fisk says. "I had expected snake handling and a foaming-at-the-mouth, tongue-speakin' type. Instead, I found a reasoned and in-depth explanation of how PTSD affects the mind and body, coupled with a specific manner to pray for healing." "Faith healing, in general, has not been something to which I've given any credence," Fisk says. "I've heard that God can heal, but I've never seen a credible instance of that in my own experience, so I didn't fully believe it until I was standing in Walmart later that night. While shopping, a mass of fellow consumers blocked me in an aisle on both sides. I didn't freak out. My pulse didn't even twitch. "As the days passed, I noticed that I had lost all anxiety related to my deployment experiences," Fisk says. "My depression vanished. I felt normal, powerful emotions. I no longer had nightmares. I stopped obsessing about snipers. I would say that I was my old self again, but that's not accurate. I was new." Fisk now operates the Lancer Legacy Ranch in the East Texas city of Maud for veterans with PTSD. Hutchings works with veterans, but trauma's prevalence extends beyond those who have returned from war zones. For instance, Kristen Petrarca's testimony relates to a workplace injury. Petrarca says she was on a plane flying from Athens, Greece, to New York City in 2014. While in the galley, she heard a piercing noise, which came from a loose door. Though she and other crew members paged the pilots, hours passed with no response. The crew endured the screech for more than 10 hours. As a result of the sound, Petrarca lost control of her facial nerves, ending her career. The skin on her face distorted and changed colors. She also lost the ability to drive, and walking became difficult due to damage to her vestibular system, the bodily system that helps maintain balance and spatial orientation. "Crossing the street was becoming impossible, and I had a hard time transitioning from walking on cement to grass," Petrarca says. "I was unable to walk on any incline, and other people's movement would cause me to lose my balance or fall. I fell so many times that I ripped tendons in both wrists and was in need of double surgery. I lost some of my hearing yet was also diagnosed with hyperacusis." Hyperacusis, as defined in the American Journal of Audiology, is a debilitating hearing disorder characterized by an increased sensitivity to certain frequencies and volume ranges. "The hyperacusis was so bad, I could not be around any sound," Petrarca says. "I had to live in seclusion for a solid year. Life was awful." Petrarca had met Hutchings before her accident, when she was a student at Global Awakening. When doctors gave her a grim prognosis, Petrarca went to meet with Hutchings, she says. When Hutchings prayed over Petrarca, he placed his hand on the left side of her face. He told her to keep her eyes open, making eye contact with him. "I remember feeling very calm," Petrarca says. "I remember feeling very safe. The first thing I noticed was that the area below my left eye stopped shaking. That particular spasm didn't hurt like the pain behind my left eye, but it felt like bugs were crawling under my eye. It made it hard to concentrate or focus on anything, and it freaked people out when they saw it. "The first time he prayed for me, all the spasms on the right side of my face stopped; the spasm between my eyes stopped; the spasm below my left eye stopped; and my face stopped turning purple, black and gray," Petrarca says. "The vulgar pain behind my eye didn't stop completely, but it became less painful, and the painful episodes became less frequent." Allie Harrison has a different story than Fisk and Petrarca: She was sexually abused for more than a decade. Before Harrison met Hutchings, she says she lived in survival mode and refused to share the intimate details of her life with anyone, including her family. Nightmares hindered sleep, and she lived detached from her emotions. "No one knew the real me or what was actually bothering me—or that there was something deep and consuming looming beneath the surface," Harrison says. "I threw myself into school, work and achievement to escape and keep my mind focused on something productive, and to find my worth when I felt I otherwise had none." Even during the time of her abuse, Harrison was a passionate, prayerful Christian. She kept a prayer wall where she wrote out all the promises she believed God had for her. This attitude drew her to a 2015 Voice of the Apostles event where she first encountered Hutchings. When she discovered his healing successes, she approached him. "I was desperate," Harrison says. "I realized healing was the only way out. Once I caught a glimpse that there was more, no one could talk me out of it." When Hutchings began to pray for Harrison, she says, permeable peace replaced her guilt and shame. Nearly three years later, this peace surrounds her and continues to grow. "That prayer seeded hope in me, as I pulled the weed-thoughts out of my mind in the season to follow," Harrison says. Trauma can be easier to identify in the case of veterans or sexual abuse survivors. But within the hallowed walls of the church, hurting people ache for healing, afraid to identify their pain at the very place that is supposed to bring them comfort. Hutchings calls it "post-traumatic church disorder," although he says he didn't coin the phrase. "When you say that phrase in a crowd in a church, everybody laughs," Hutchings says. "They laugh at it with a very nervous laugh because they all know that it's true. So what we do is we meet with church leaders, we meet with people, and however they've been abused, we just go after them." Hutchings says there is widespread trauma within church leadership as well. He says the body of Christ doesn't know how to deal with negative emotions, especially trauma: "We have a tendency to be in denial about it. We put on a happy face, and we don't know how to create an environment within the church where people actually get healed of their trauma and get set free." Hutchings loves the church and works with congregations around the world to train ministry teams and leaders to perform healing work. Jesus is coming for His spotless bride, and the church is going through the refining fire to make herself ready for Him, Hutchings says. Treating trauma is part of that refining. Within a congregation, trauma can occur when pastors or leaders experience moral failure. It can also happen when men and women of faith succumb to an illness for which the church had been crying out for healing. To address trauma, Hutchings says church leadership should set up an atmosphere where negative emotions are not stifled. The atmosphere—be it a conference, seminar or special small group—should be a safe space where trauma can be openly discussed to promote healing. Often, especially in the charismatic church, leaders label trauma as a spiritual battle, and at times, the affected individual must fight it alone. Leaders also tend to encourage those suffering hardship to press in for joy, which could actually be detrimental. "In the church as a pastor, we have this pressure to make everybody happy, happy, happy; joy, joy, joy; act like everything is fine when in reality everybody's broken and bleeding," Hutchings says. "So we have to create an atmosphere in church leadership where we can talk about how do we deal with negative emotions that come from broken souls." The feelings that stem from atrocities are valid and need to be addressed: "They're not a lack of faith," Hutchings says. "They're not something that's sinful." Hutchings believes the church can be the catalyst in advancing the kingdom of God, especially through healing. "We have to understand how prevalent the issue of trauma is throughout our society and move in such a way that we can address this and make people feel it's OK to honestly say, 'Hey, I'm really wounded. I need some help.'" Churches must not ignore or even facilitate the pain that haunts people who have suffered soul injuries. Healing can come if the church abides by the Psalm 147:3 prophecy Jesus fulfilled: "He heals the broken in heart, and binds up their wounds." Jessilyn Justice is online news director for Charisma Media. 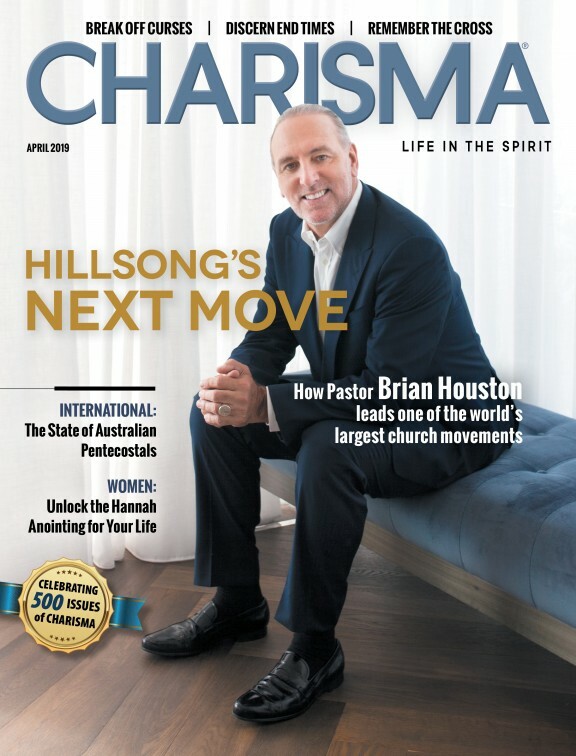 Dr. Mike Hutchings speaks about how he helps free people from post-traumatic stress disorder through healing prayer at ptsd.charismamag.com.